Family Vision Care of Bountiful is proud to announce the arrival of the iWellness OCT scan. 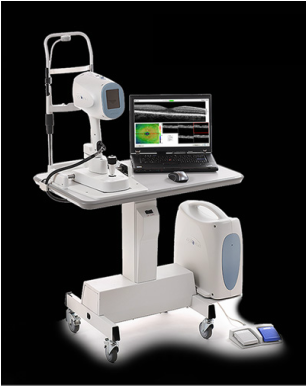 This is a non-invasive, scan of the back of your eye with a laser called SD-OCT.
SD-OCT is essentially an MRI for the eye. It allows the doctors to see retinal nerve layers in exquisite detail that is not visible with traditional examination methods. Using this information, the doctors can diagnose and treat retinal conditions like macular degeneration, diabetic eye disease, and glaucoma at the earliest stages possible. This technology is available to all of our patients for a very reasonable fee of only $32.00. Ask for the iWellness scan today!